Patrons of the Stonington Public Library will soon see a new, but familiar, face behind the check out desk or stacking new books on the shelves. Jill Larrabee, who has served on the library board for two years, has been hired as the library’s new director. Longtime director Vicki Zelnick is retiring after nine and a half years in the position. “It felt like it was time. [The kids] are at the age now where they are a lot more independent,” she said. The library board started its search for a new director in October after receiving Zelnick’s resignation letter, at which time Larrabee decided to step down from the board and apply. “It just felt like a natural fit into my every day life,” said Larrabee. She added that she still has “lots to learn,” but the transition has been fairly smooth. 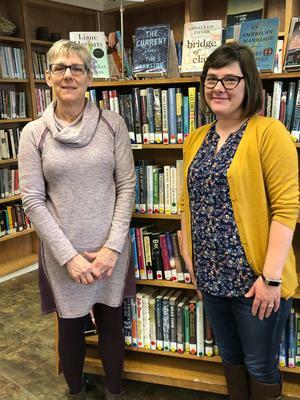 Zelnick is still part of the every day work at the library, and she and Larrabee have been working in tandem over the last few weeks. “I will stay on for the next week or so, and then slowly start to fade into the background,” said Zelnick. The library has undergone several changes during Zelnick’s almost 10 years. When she started, the books were cataloged manually instead of with an automated system, the home delivery of books and materials was not as used as it is now, and the building itself has been through major construction renovations. Each change has helped the library develop, she said, being able to offer more options for patrons and to put on more events such as author readings and children’s programs. Larrabee agreed, adding that the programs they have been able to put out for children in the community have started to grow in the last couple of years. “I think there is a stigma that libraries are very harsh, someone is constantly telling you to be quiet. But we’re starting to see kids coming in and being much more comfortable here, which is really what we want,” said Larrabee. Adults and children alike, Larrabee said she is most looking forward to getting to know her patrons, both year-round and summer populations. “I’m anxious to talk about books with them, to hear about what they like and be able to recommend something to them,” she said. “This job is the best there could possibly be, and I have no doubt Jill is going to do a phenomenal job doing it,” added Zelnick.